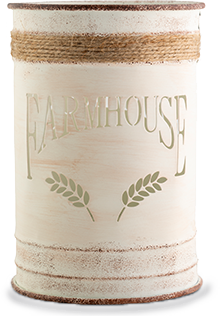 A creamy-white antique finish featuring “farmhouse” and wheat grain cutouts and a yarn wrap accent embody the oh-so-popular farmhouse style on this embellished metal shade. Measures 4'' diam. X 6''h.